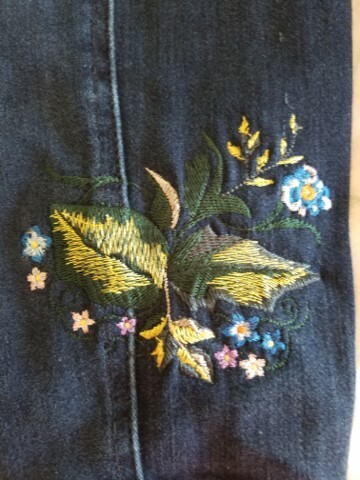 “Here is a picture of a design I put near the ankle of my Niece’s jeans. It is the current free design BFC30826MD. I used a cut away stabilizer because the jeans had some stretch in them, and BFC thread which I, and my Babylock machine love both for quality and price. I opened the inseam, used a #12 sharp needle and had no problem stitching through the flat fell seam. My niece said she got several compliments from her co-workers last casual Friday.